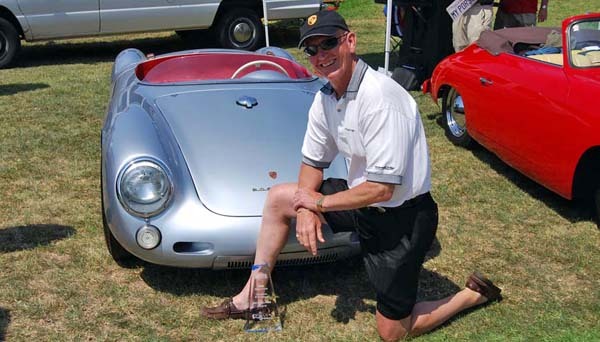 As a tribute to the accomplishments Jack McAfee made in both selling and racing Porsches, the McAfee family and Porsche 356 Club present the "Jack McAfee Award" at the annual Dana Point Concours in California. The award will be given for four years only ending in 2010. 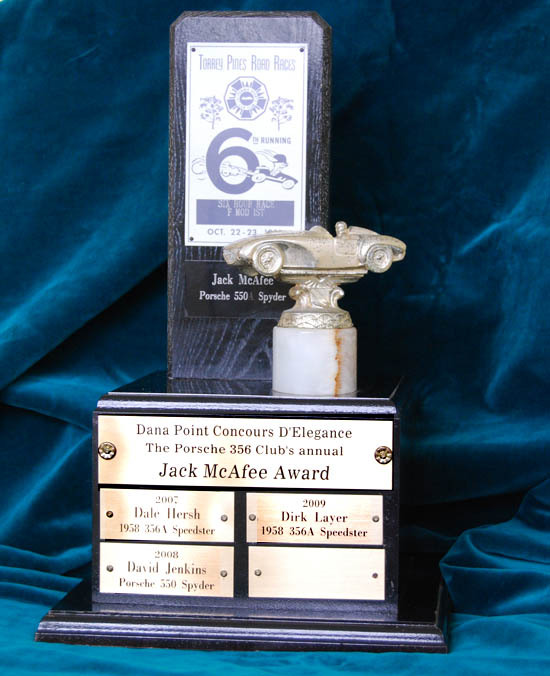 Mounted on a new base, this is the original trophy marking Jack's first "class win" driving a Porsche 550 spyder. The race was the 1955 Torrey Pines 6 hour endurance event, and having equipped the car with an auxiliary fuel tank, Jack drove the race non-stop to take a 2nd OA, and 1st in class. Just as "Big Jack" would have wanted, this award is given in the spirt of California Sports Car racing in the 1950s; Run what you brung and have fun! I will present the award to the car that I believe Jack himself would pick as the car which best represents West Coast racing in the 50s/60s. As is the wish of this award's founders Pete McNulty and Rex McAfee, this award is given on an emotional basis in the spirit of Jack McAfee, and is by no means a conventional award where strict points and categories are used to pick the winner. The winner will receive a separate trophy to keep their name will go on the base of the perpetual trophy shown above. The only strict rule is that no car can win this award more than once. I'd like to thank Pete McNulty and everybody else involved in this award. See you at Dana Point! 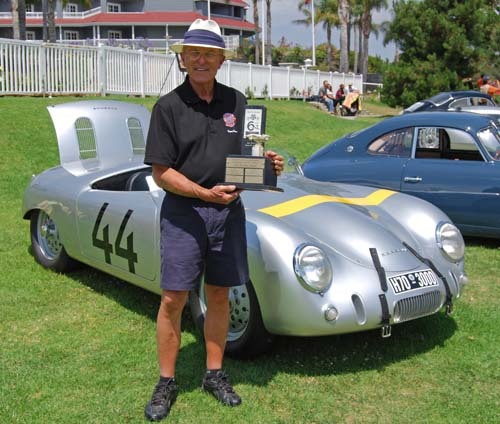 The McAfee family and Porsche 356 Club congratulate Dale Hersh for earning the inaugural Jack McAfee Award with his famous 1958 Porsche 356A Speedster. 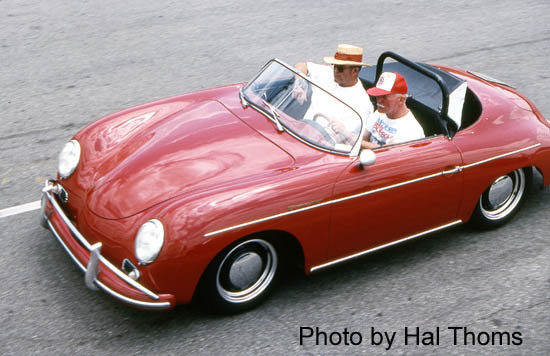 Just like "Big Jack", Dale earned his Pacific Coast Championship racing his Speedster at Riverside Raceway, Laguna Seca, Pomona, Santa Barbara, and other famous West coast venues. The combination of Dale’s skills and West Coast competitive spirit enabled Dale to beat Ken Miles and other fierce competitors who often drove more “properly” prepared race cars. 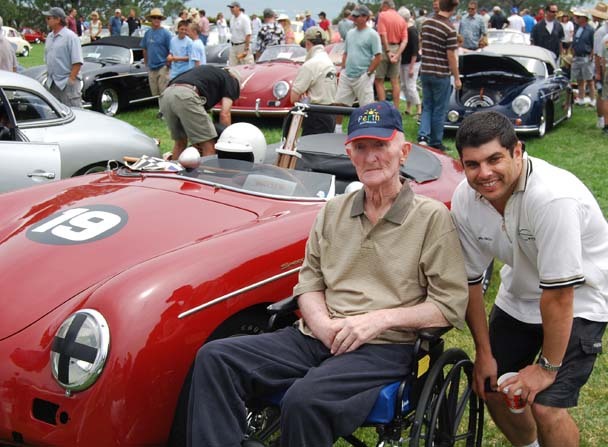 Here’s to you Dale for your part in building the Porsche legend…Southern California style! Here's Dale and Jack taking a lap around the old Pomona course in 1995. As for the car's future, you can rest assured it will be properly prepared and raced at vintage events under the care of its current owner/driver Steve Schmidt. 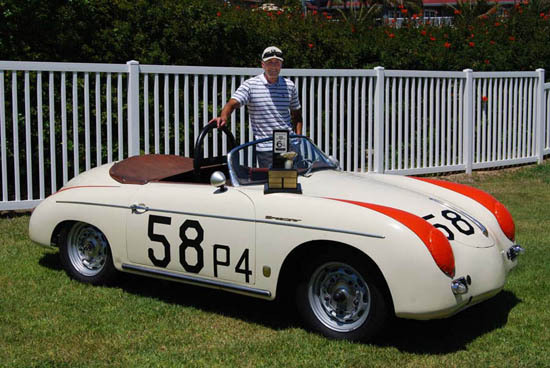 The 550 Spyder was Jack McAfee's favorite race car because of its light nible handling. This particular 550 was owned by the late John Bond, a close friend of Jack that would eventually become the owner of Road & Track magazine; the staple sports car publication of that era. With a motor recently built by famed mechanic Bill Doyle and final track preparation completed by Andial, we have no reason to doubt this gem will soon be finding its way back on the track as is the case with other Porsches owned by David. Big Jack wouldn't have it any other way! Wow! 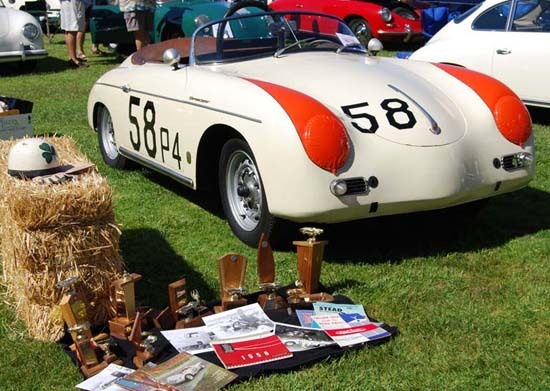 Dirk Layer and his recently acquired 58 Speedster couldn't have captured the spirit of the Jack McAfee Award any better. An authentic West Coast SCCA racer in the 50s and 60s, this car was raced by Charles Foie at several of the more famous racing venues of the past including Laguna Seca, Cotati, Sacromento and Santa Barbara. Just as impressive as the car's history was Dirk's display (below). Programs and trophies from the car's racing past were on display(take a hint 2010 show entrants, Dirk has raised the bar and you need to follow!). Thanks Dirk for hitting the bull's eye this year! Here on the West Coast, the early 1950s hot rodding scene was largely centered around WWII veterans making specials for road racing, the dry lakes, drag strips and more. Not to be excluded on the other side of the Atlantic were some very ingenious Europeans, one of which who be instrumental in influencing Porsche's racing future; Walter Glockler. This 1952 special is all about achieving one purpose, and that's superior road racing performance. Big Jack loved specials, so there's no surprise this German beauty deserved the fourth and final Jack McAfee Award.